This delightful woodland nature reserve has excellent access (suitable for wheelchair users and for prams and pushchairs) with surfaced paths and boardwalks that meander along the edge of a pretty stream. 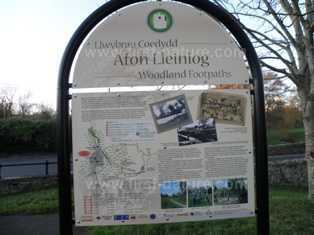 The trail can be accessed from a public car park in the centre of Llangoed village, and it links to the Isle of Anglesey Coastal Path at Lleiniog Beach. The woodland path is an excellent place to see birds including Woodpeckers, Siskins, Redpolls and Wrens. Ancient woodland plant species, including the Early Purple-orchid (Orchis mascula) and Sanicle, can also be found on the site. On Anglesey take the A545 from Menai Bridge to Beaumaris and then on to the village of Llangoed. There is a public car park in the village close to the start of the walks. 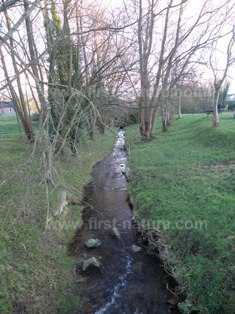 Below: The pretty stream which runs through the walk. There is a shop in the village of Llangoed, and there are public toilets, pubs, shops and restaurants in Beaumaris. The area is home to at least four different species of bats, and mammals that live there include Field Voles, Bank Voles, Wood Mice and the Common Shrew. Otters have also been recorded at this reserve. A leisurely walk from the village of Llangoed through the reserve and down to the beach is a lovely way to spend an afternoon.